This example Social Enterprise Architecture Blueprint focuses on social concepts like Social Media and is created on Dragon1. Dragon1 is a collaboration platform on which you as Business Professional can learn, create, share and control interactive content. What is a Social Enterprise Architecture Blueprint? 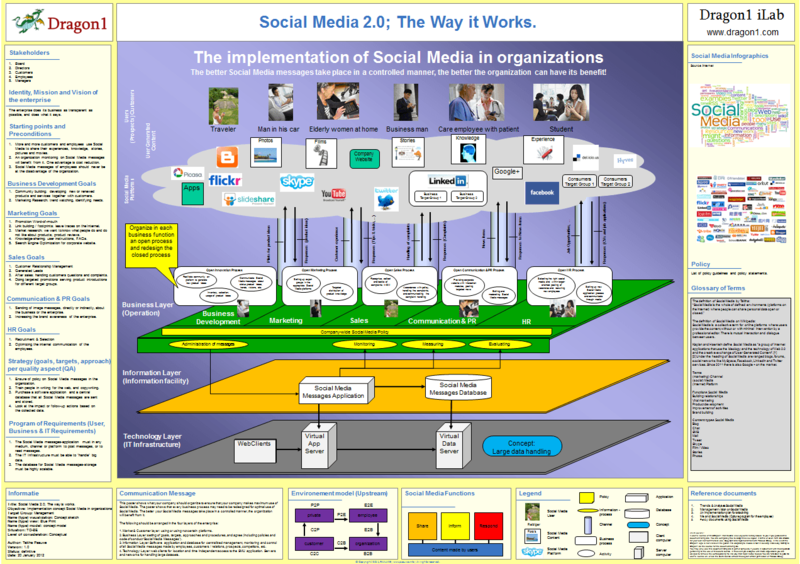 A Social Enterprise Architecture Blueprint shows how an organization makes use of social media concepts: what benefit does it want to gain from social media and how is social media implemented? A Social Enterprise Architecture Blueprint is a building plan visualization for an enterprise with a focus on social concepts as part of an enterprise architecture. This Social Enterprise Architecture Blueprint shows how the data of the social media platforms the organization uses, is stored in one singe source data base. Giving an overview of the enterprise layers, their building blocks and their interdependencies. Increase the ability for the business to prioritize. Communicating the status of strategy & operations blocking or enabling building blocks in the organization. Increasing Business Continuity, lowering the risk of interruption. Reporting where exactly the current situation is unknown (black holes) to management or where the situation is not compliant to standards. Increase enterprise governance, compliancy and control. Reporting exactly data or information is not used optimally or even stored duplicate. Making more use of information as an asset. Speed up Results You can have your version of the Social Media Enterprise blueprint after days by only updating the example. Dynamic Visualizations If you change model data, the visualization template is automatically updated. Repository Collaboration You can be productive as a team working together on a Social Media Enterprise architecture blueprint. An interesting wiki page is about the enterprise architecture of the USA Government. Do you want to start immediately? You can purchase your Dragon1 PRO subscription here online. If you do not have the time and you need an Architecture Blueprint on short notice, we can create a Blueprint for you.